Intel Debuts New Atom System-on-Chip Processor – Carpet Bomberz Inc.
Intel Atom and FPGAs in the news. I hope a product using the Intel Stellarton cpu sees the light of day. At an IDF keynote, Intel launched “Tunnel Creek,” a new Atom E600 SoC processor. 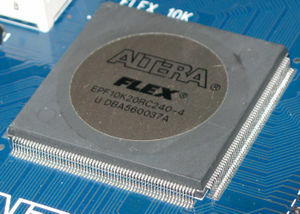 One particular processor detailed is codenamed “Stellarton,” which consists of the Atom E600 processor paired with an Altera FPGA on a multi-chip package that provides additional flexibility for customers who want to incorporate proprietary I/O or acceleration. via Intel Debuts New Atom System-on-Chip Processor. Intel has announced a future product that pairs an Intel Atom processor with a Virtex FPGA. Now this is interesting, I just mentioned FPGA (field programmable gate array) chips and out of the blue Intel has summoned the same chip and married it to a little Atom core processor. They say it could be used as an accelerator of some sort. I’m wondering what specifically they had in mind (something very esoteric and niche like a TCP/IP offload processor). I would like to see some touting of its possible uses and not just say, “We want to see what happens.” Unfortunately the way the competition works in Consumer Electronics, you never tell people what’s inside. You let folks like iFixit do a teardown and put pictures up. You let industry websites research all the chips and what they cost, estimate the ones that are custom Integrated Circuits and report the cost to manufacture the device. That’s what they do with every Apple iPhone these days. It would be cool if Intel could also sell this as a development kit for Stellarton’s users. Keep the price high enough to prevent people from releasing product based just on the kit’s CPU, but low enough to get people to try out some interesting projects. I’m guessing it would be a great tool to use for video transcoding, Mux/DeMuxing for video streams, etc. If anyone does release a shipping product thought it would be cool if they put the “Stellarton Inside” logo, so we know that FPGAs are doing the heavy lifting. The other possibility Intel mentions is to use the FPGA as a proprietary I/O so possibly like an Infiniband network interface? I still have hopes it’s used in the Consumer Electronics world.